Description: CSX train Q204 at the east end of Fritchton siding on the former B&O St. Louis line. Description: CSX unit trash train K277 glides west on 2 under the S. Philly connection approaching Grays Ferry behind a pair of former Conrail EMDs on a sunny morning. Incidentally, the 8757 is the only SD60M in YN3 a/k/a dark future paint. Description: A manifest under rare sunny blue February skies! 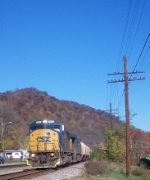 Description: CSX 5354 and 8757 roll through Mt. Winans Yard. Description: CSX stack train Q190 eastbound over Amtrak/Septa 30th Street Station vicinity. Description: A Nice Mix of Power on Q705. Description: CSX 8757 leads a southbound grain train. Description: CSX SD60M 8757 trails on Q275 South. Description: Trio of YN3 units pull CSX general freight Q438 eastbound by the B&O CPL signals at 58th Street. Description: An Oak Point to Fresh Pond Junction transfer on the Fremont Secondary is about to pass under the 69th Place overpass in the Middle Village neighborhood of Queens. The snowplow has been notched out on both sides for third rail clearance, specifically for Oak Point to Selkirk runs up the east shore of the Hudson River.